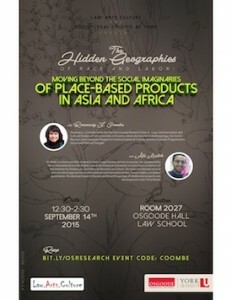 “Hidden Geographies of Race and Labour: Moving Beyond the Social Imaginaries of Place-Based Products in Asia and Africa” (with Ali Malik). Presentation to Law/Art/Culture Symposium. Osgoode Law School, York University, Ontario.